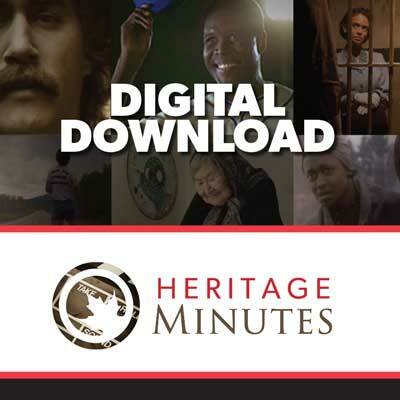 The Heritage Minutes are dramatic interpretations of pivotal events in Canada's history. These 60-second vignettes commemorate notable Canadians, achievements in innovation, and instances of perseverance and bravery. They are intended to entertain, educate and encourage further research into our nation's past. This new DVD collection brings together all of the classic Heritage Minutes (including, for the first time, the Military Minutes produced in 2005), as well as the new Minutes produced since 2012. For more information about Lucille Teasdale visit The Canadian Encyclopedia. For more information about the Iroquois Confederacy visit The Canadian Encyclopedia. For more information about Vikings visit The Canadian Encyclopedia. For more information about Jacques Cartier visit The Canadian Encyclopedia. For more information about Jean Nicollet visit The Canadian Encyclopedia. For more information about Governor Frontenac visit The Canadian Encyclopedia. For more information about Ezekiel Hart and Louis-Joseph Papineau visit The Canadian Encyclopedia. For more information about Étienne Parent visit The Canadian Encyclopedia. For more information about Joseph Casavant visit The Canadian Encyclopedia. For more information about the Paris Crew visit The Canadian Encyclopedia. For more information about the Saguenay Fire visit The Canadian Encyclopedia. 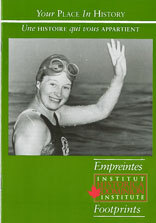 For more information about Jennie Trout visit The Canadian Encyclopedia. For more information about Sitting Bull visit The Canadian Encyclopedia. For more information about Les Voltigeurs de Québec visit The Canadian Encyclopedia. For more information about Joseph Tyrrell visit The Canadian Encyclopedia. For more information about Sir Sandford Fleming visit The Canadian Encyclopedia. For more information about rural teachers in Canada visit The Canadian Encyclopedia. For more information about soddies visit The Canadian Encyclopedia. For more information about basketball visit The Canadian Encyclopedia. For more information about Sam Steele visit The Canadian Encyclopedia. For more information about Frontier College visit The Canadian Encyclopedia. For more information about Guglielmo Marconi visit The Canadian Encyclopedia. For more information about Grey Owl visit The Canadian Encyclopedia. For more information about Valour Road visit The Canadian Encyclopedia. For more information about Winnie-the-Pooh visit The Canadian Encyclopedia. For more information about Chinese Canadians and the CPR visit The Canadian Encyclopedia. For more information about John McCrae visit The Canadian Encyclopedia. For more information about J.S. Woodsworth visit The Canadian Encyclopedia. For more information about the Halifax Explosion visit The Canadian Encyclopedia. For more information about Joseph-Armand Bombardier visit The Canadian Encyclopedia. For more information about Superman visit The Canadian Encyclopedia. For more information about the Myrnam Hospital visit The Canadian Encyclopedia. For more information about La Bolduc visit The Canadian Encyclopedia. For more information about the Bluenose visit The Canadian Encyclopedia. For more information about Emily Carr visit The Canadian Encyclopedia. For more information about Marion Orr visit The Canadian Encyclopedia. For more information about Maurice "Rocket" Richard visit The Canadian Encyclopedia. For more information about Jackie Robinson visit The Canadian Encyclopedia. For more information about John Humphrey visit The Canadian Encyclopedia. For more information about the Avro Arrow visit The Canadian Encyclopedia. For more information about Paul-Émile Borduas visit The Canadian Encyclopedia. For more information about telecommunications visit The Canadian Encyclopedia. For more information about Maurice Ruddick visit The Canadian Encyclopedia. For more information about Jacques Plante visit The Canadian Encyclopedia. For more information about Marshall McLuhan visit The Canadian Encyclopedia. For more information about the national flag of Canada visit The Canadian Encyclopedia. For more information about Expo '67 visit The Canadian Encyclopedia. For more information about Nat Taylor visit The Canadian Encyclopedia. For more information about Mennonites in Canada visit The Canadian Encyclopedia. For more information about Nellie McClung visit The Canadian Encyclopedia. The Métis leader recalls his struggle for his people in the moments before his execution (1885). For more information about Louis Riel visit The Canadian Encyclopedia. For more information about Maple Leaf Gardens visit The Canadian Encyclopedia. For more information about Andrew Mynarski visit The Canadian Encyclopedia. She meets her future husband who confirms her nationality to Canadian forces liberating the nation. For more information about Mona Parsons visit The Canadian Encyclopedia. For more information about Tommy Prince visit The Canadian Encyclopedia. The Battle of Vimy Ridge, during the First World War, is Canada's most celebrated military victory — an often mythologized symbol of the birth of Canadian national pride and awareness. The four divisions of the Canadian Corps, fighting together for the first time, attacked the ridge from 9 to 12 April, 1917 and captured it from the German army. It was the largest territorial advance of any Allied force to that point in the war – but it would mean little to the outcome of the conflict. More than 10,500 Canadians were killed and wounded in the assault. For more information about Sergeant Major John Osborn visit The Canadian Encyclopedia. For more information about housing in Canada visit The Canadian Encyclopedia. For more information about General Jacques Dextraze visit The Canadian Encyclopedia. For more information about Juno Beach visit The Canadian Encyclopedia. For more information about Nursing Sisters visit The Canadian Encyclopedia. The 84th Heritage Minute in Historica Canada's collection. For more information about Chanie Wenjack visit The Canadian Encyclopedia. The 83rd Heritage Minute in Historica Canada's collection. For more information about Treaty 9 visit The Canadian Encyclopedia. For more information about Kenojuak Ashevak visit The Canadian Encyclopedia.